Trying to figure out the best massage chair to buy after massage school can be a bit confusing. Which brand, model, and features are best for you, your clients, and your business? Because it is growing in popularity with consumers who want the convenience of a massage in their home or workplace, this is a common choice of massage jobs for many therapists. Massage chairs that last a lifetime! Seated chair massage has long been found in spas and salons, but we now see this service offered in malls, airports, large office buildings and other public areas to help consumers relieve the pain of tight, overworked muscles. Many therapists decide to do seated chair massage as their full-time massage job. This is marketed to people as a way to relax during the long workday. But, how do you choose the best massage chair for this type of work? Massage chair reviews are helpful to read when you are searching for specific recommendations of a brand or model of massage chair. Reviews can provide comparisons of different chairs by experienced therapists, which can provide honest opinions to help you decide which one is right for you. Choosing the best massage chair is important because it's one of the largest investments a new massage therapist makes in his/her business, especially if you choose to open a mobile chair massage practice. 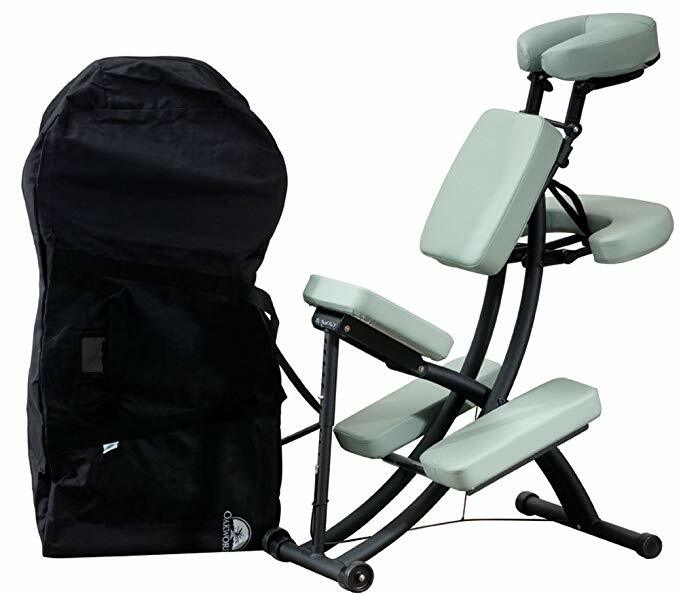 If you are planning to use your chair to market your primary massage table services, a less expensive model is fine. However, if your chair will be your primary source of income, choose wisely. A massage chair that can easily be set up in airports, malls, and offices should be a well-built, lightweight model that can withstand daily use. But, you should also be able to adjust it easily to ensure the client's optimal position. Read more about ensuring seated chair massage comfort with highly-rated chairs. Less expensive chairs can cost $150-$350.They are usually lightweight (15-22 lbs.) and can be adjusted fairly easily. Make sure the best massage chair for you and your business has one thing - wheels! Or, make sure it includes a carrying case with wheels. This gives either the chair or the case the hard job, and all you have to do is steer in the direction you want to go. More expensive chairs can cost $250-$600. They are also lightweight (15-26 lbs), can be adjusted very easily, and have more areas that have the option to adjust. The Portal Pro 3 Massage Chair By Oakworks weighs only 19 lbs, and offer's the optimum and ergonomic patient access to cervical, thoracic and lumbar spine, as well as scapula and shoulder regions. It fits clients from 4'11' to 6' 4" and up to 300 lbs. Your clients will find comfort and support on the Portal Pro by Oakworks, which comes in a large variety of colors, with an instructional video about how to set this chair up. Most chairs adjust easily, however, the higher quality may be a bit easier. Your best massage chair will only have two-three steps to complete set-up, others have many more. Be very comfortable and practice adjusting your massage chair several times. Look at chair massage pictures and video that provide different situations and how to adjust the chair for those situations.You should know how to adjust quickly if the client is uncomfortable because of any physical issues. Many people have never had massage therapy before, and chair massage is a great way to introduce folks to the benefits of this healthy addiction. Getting the word out that you provide seated chair massage just takes a little time and lots of connections with friends, family, and co-workers of co-workers. Provide business cards and brochures, along with a marketing flier specifically talking about the benefits of massage therapy, and what a great stress-relieving service it provides for employees at the office. What products are used and why they are beneficial in seated massage for office employees - for instance, you could mention that you use lotion or creams instead of oil for employees who must go directly back to work, or, if you use massage stones or other tools in chair massage. Mention the benefits that your brand of massage chair offers, and that it is one of the best massage chair brands on the market today. You may also want to read about advantages of using a massage chair verses a massage table at MassageMagazine.com. As massage services become more and more requested in the work setting, therapists will be choosing seated massage jobs as their main income source. So, have the advantage. Follow our suggestions for marketing your services...and getting those business clients to call you first!